You'd better start swimmin' or you'll sink like a stone. First time staying in Provo for spring/summer, and that's just weird, too. and I'm reminded of why I love the Twentieth Century more than anything. Wikipedia makes it sound like Bob Dylan was pretty much a jerk and only wrote "The Times They Are a-Changin'" because he knew it would sell. 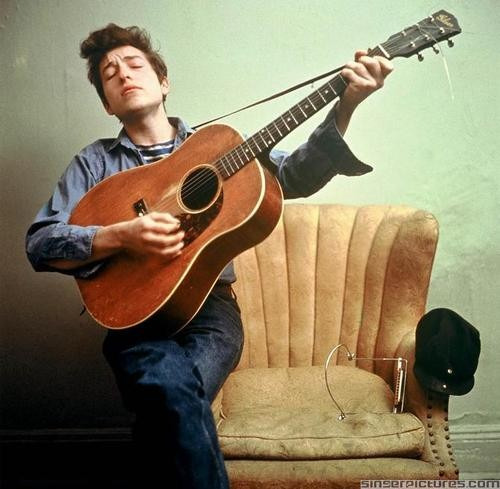 He said, "I wanted to write a big song, with short concise verses that piled up on each other in a hypnotic way." You've got to respect songwriting that can just repeat the same simple tune over and over without boring you. The world today needs more of it. My favorite cover of this song is by Peter, Paul and Mary. I love when Mary goes high on the chorus. And they're also adorable. That's all there is to it. I like James Taylor & Carly Simon's cover, too. And Simon and Garfunkel's. Their harmony is really nice. Though not quite as hard-hitting. I decided I need more Simon and Garfunkel in my life. That might be just what I needed. But why the times always gotta be changing? Ashley and I decided that there is a fine line between nostalgia that helps you learn from the past and rampant romanticizing. I tiptoe that border every day. Please get out of the new one if you can't lend your hand. P.S. My word verification was "gorwomid." Villian of a future sci-fi movie hit? I think so.